Pelican Products, Inc., the global leader in the design and manufacture of protective case solutions and advanced portable lighting systems, has introduced its new Pelican-Hardigg™ V-Series Rack Cases. This value-priced, feature-rich case line is designed for light commercial and consumer usage and will be sold out-of-the-box ready for immediate use, worldwide. All Pelican-Hardigg V-Series cases are available in black and feature square hole uprights engineered to provide universal tool-less and secure transport for rack mountable electronics. They are available in two models: The Classic-V and the Super-V. The Pelican-Hardigg Classic-V case comes in black and is available in 3U, 4U, 5U, 7U and 9U with a 33” rack depth. It includes one 2.5” and one 5.25” lid, four removable heavy-duty bottom casters, anti-reflective black hardware, including black stainless steel handles, lid hangers for storing the lids while in use, coupling catches for secure stacking, and a sealed gasket and PRV to keep the container airtight / watertight and eliminate over-pressurization. 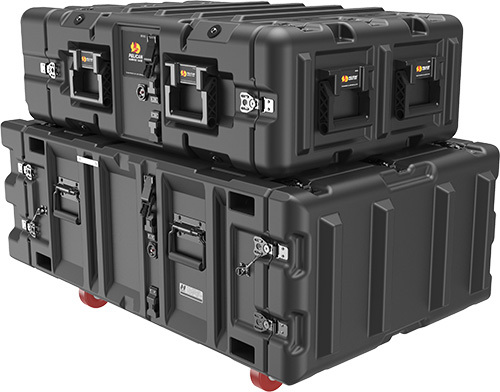 The Pelican-Hardigg Super-V case is available in 3U, 4U, 5U, 7U, 9U, 11U and 14U with a 24” rack depth. It includes one 2.20” and one 5.20” lid, molded in-rear edge casters with handles on the 2.2” lid for ease of movement, comfort grip plastic handles, lid hangers for storing the lids while in use, anti-reflective black hardware, coupling catches, and a sealed gasket and PRV to keep the container airtight / watertight and eliminate over-pressurization. Both models are REACH and RoHs compliant and backed by Pelican’s industry-leading warranty. For more information on these cases and the full Pelican line, visit http://pelican.com or contact an authorized dealer. Pelican Products, Inc. is a portfolio company of Behrman Capital, a private equity investment firm based in New York and San Francisco. Pelican Products, Inc. is the global leader in the design and manufacture of high performance protective cases, temperature controlled packaging solutions, advanced portable lighting systems and rugged gear for professionals and outdoor enthusiasts. Their products are used by professionals in the most demanding markets including fire safety, law enforcement, defense / military, aerospace, entertainment, industrial and consumer. Pelican™ products are designed and built to last a lifetime. The company operates in 21 countries, with 22 international sales offices and six manufacturing facilities around the globe. In Europe, the company does business under the name Peli Products, S.L.U. For more information, visit www.pelican.com or www.behrmancap.com. All trademarks and logos displayed herein are registered and unregistered trademarks of Pelican Products, Inc.